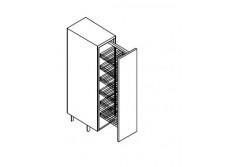 Midi Pull-Out Larder Unit. 1250mm x 300mm wide. Requires a 1245mm x 296mm wide door, Chrome pull-out with 6 baskets supplied fitted.